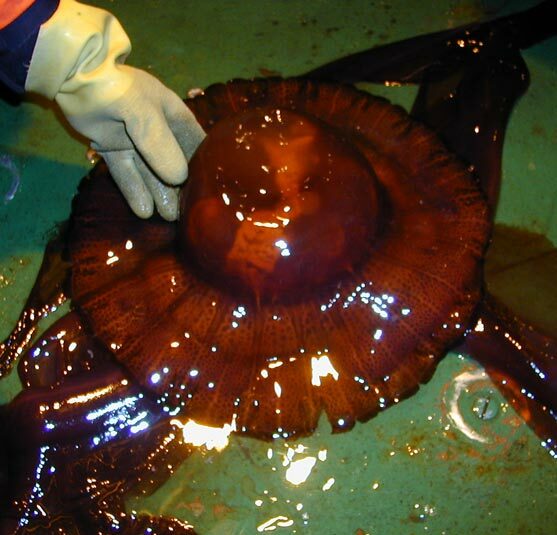 Stygiomedusa gigantea is the largest jellyfish in the ocean. The specimen you see here is about one-third its maximum size. Its deep burgundy color is good camouflage at the depths it normally inhabits: 300-2000 m. We get them commonly down in the Antarctic. It is one of the major deep-sea predators here, feeding on krill and small fishes (Photo by Sarah Dizick).